Ireland is getting closer to the Shamrock Bowl! In the last couple of days, Scott Morrow wrote great pieces about all 4 teams, and now, we have the game reports! 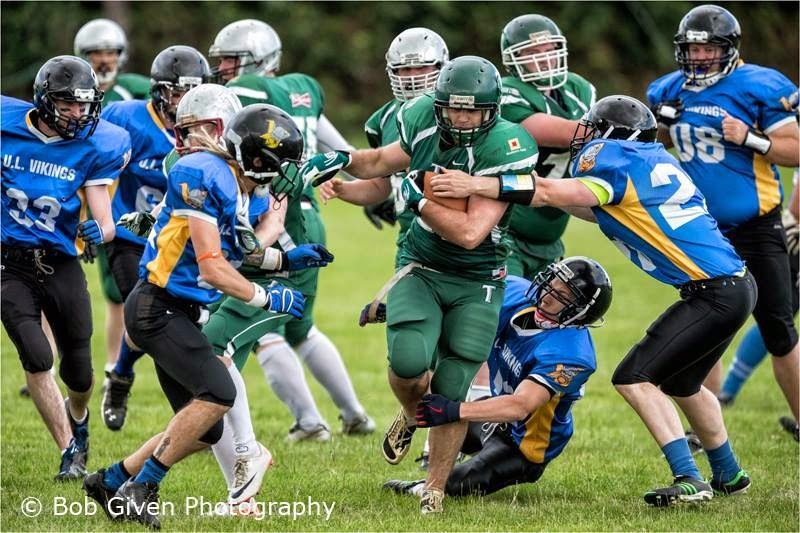 The defending champions, The Belfast Trojans booked their place in the Shamrock Bowl final for the third consecutive season by defeating The University of Limerick Vikings in what can be described as nothing less, than a battle! Each team came into the game after impressing throughout the regular season, but there was only one goal in mind for these sides; to reach the Bowl game. Everyone knew this match would be a close one, but nobody could predict that it would be decided late in the fourth quarter. The match was on a knife-edge from the beginning, with both teams coming up with huge defensive stops as the game swung back and forth throughout the first quarter. The Trojans got the first score of the game however, as kicker Rick Duffield converted a field goal to give the Belfast side a marginal 3-0 lead going into the break. The Vikings started the brightest in the second half and their efforts were rewarded when a play action pass fooled the Trojans defence and receiver, Gavin Duffy reeled in the deep catch to put UL 6-3 up after the failed PAT. With the game entering the fourth quarter, tensions were getting high and neither team was prepared to give up their place in the final. As the match entered the final quarter, many people felt that this would be the end for the Trojans. However, when champions are up against it; they respond. In a breathtaking 12 minutes, the Trojans turned the match on its head. First, Defensive Tackle, Patrick McElkerney made arguably the game changing tackle when he sacked the Vikings Quarterback and recovered the fumble. With the resulting drive, receiver David Richardson caught a deep pass from Quarterback, James McKelvey to give the Trojans excellent field position. It was then left to Running Back, Dave Colvin to rush in for a touchdown that would regain the lead for the Belfast men. Rick Duffield kicked the extra point which made the score 10-6. With that, the momentum greatly turned in the Trojans favour as Colvin would add another two touchdowns to his name, including a 50-yard scamper that he would take untouched to the end zone. As the game entered the final stages, there was still time for Safety, Matt Armstrong to return a ‘Pick 6’ all the way to the house to give the Trojans the victory with a 28-6 score line. The Vikings fought tooth and nail throughout the four quarters, and the result doesn’t do justice for their efforts on the day. The champions knew they were in for a tough game, and the Vikes made them work hard for the victory. The Trojans will now take on Trinity College in the final as they defeated the Rebels, 47-8 in the other semi final that took place at Westmanstown. Can the Trojans win their third National Championship? The Final takes place on August 10th, at Tallaght Stadium, Dublin. 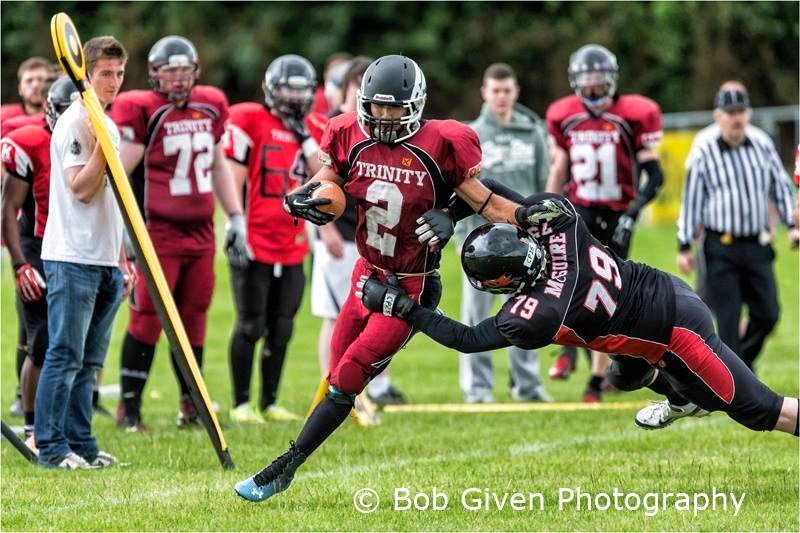 With Trinity College and the Dublin Rebels kicking off the second semi-final, both sides knew that a win would book them a place in the Shamrock Bowl final against the reigning champions, the Belfast Trojans. The Rebels playing in yet another semi-final, hoped that a victory would give them the opportunity to potentially claim their 8th National Championship, whilst Trinity College had their heart set on making their first ever Shamrock Bowl appearance. This game was predicted to be close affair with two of the leagues best running backs, Simon Mackey and Rob McDowell pitting their talents against one another. The hype surrounding these two had been brewing nicely in the weeks leading to the encounter, but only one man would come out victorious. As early as the opening kickoff, Rob McDowell does what he does best and scored a 100-yard return to give Trinity College an early 6-0 lead. From then on, it was one-way traffic. After recovering a fumble, Trinity extended their lead when McDowell rushed in again to give the students a 13-0 lead as the first quarter ended. The second quarter started similar to the first, as McDowell again ran in from 4 yards to increase Trinity’s lead as the Rebels were still struggling to get a foothold in the game. It began to get worse for 7 time champions, as another fumble was recovered and taken to the house by David Lunn for a defensive touchdown. Rob McDowell added his fourth touchdown of the game soon after, this time with a 90 yard return before Quarterback, Dan Finnamore found receiver Daniel Murphy in the end zone for a 35 yard passing reception to give Trinity a commanding 41-0 lead at half time. With the game getting away from them, The Rebels knew their second half performance needed to be something special. They managed to get on the score sheet when QB Andrew Dennehy passed to Chris Purdy who ran the remaining 20-yards for the touchdown, with Peter Keeley adding the extra 2 points. Any hope of a miraculous comeback by the Rebels was well and truly diminished when a further score by Ola Bademosi completed the touchdown overhaul for the students. Connor McGinn kicked 5 PAT’s throughout the game to give Trinity an emphatic 47-8 over the Rebels. The Rebels have had an impressive year after making it to yet another Shamrock Bowl semi final. By defeating the Knights in the wildcard round, and playing an exhibition game against American side, Centre College, the Rebels have done themselves proud for their efforts this year. Expect them to be challenging among the elite teams again next term. Meanwhile, Trinity will now take part in their first ever Bowl appearance, when they take on The Belfast Trojans on August 10th. Trinity prevailed in the last meeting between these sides, but expect a fantastic game between the leagues best two teams this year. The final takes place at Tallaght Stadium in Dublin.